If dorsiflexion (pulling the foot upward) is limited by osteophytes (bony outgrowths that develop when cartilage deteriorates), we will resect the osteophytes through an anterior (front of the foot) incision. If plantar flexion (pushing the foot downward) is limited by osteophytes, they are removed via a posterolateral (to the side and to the back) incision. To prevent osteophytic recurrence, bone wax is applied to the bone. Nonsteroidal anti-inflammatory drugs (NSAIDs) are administered postoperatively for 6 weeks to inhibit bone formation. However, NSAIDs are not administered if an osteotomy is performed during surgery. Equinus contracture is released by performing a gastrocnemius recession, a gastrocnemius-soleus recession, or an Achilles tendon lengthening. We prefer gastrocnemius recession or gastrocnemius-soleus recession, in order to maintain muscle strength. A posterior capsule release may be necessary to restore ankle joint range of motion. A tarsal tunnel decompression is often necessary to prevent nerve entrapment. When acute release does not reduce the equinus, it can be corrected gradually via distraction. Ankle joint malalignment due to deformities such as valgus and recurvatum may be the underlying cause of the ankle joint degeneration. To preserve the ankle joint, we will perform reorientation procedures, including osteotomy (surgical bone cut). Correction is usually done using a supramalleolar osteotomy. If there is incongruence between the tibia and fibula, then the tibia can be lengthened or the fibula shortened to restore normal ankle anatomy. We will address any subtalar joint contractures at the time of realignment and distraction. This can be done acutely via release or gradually via the external fixator. The hinged external fixator is applied to the foot and tibia. We prefer to simultaneously distract both the subtalar and ankle joints acutely. This is done by applying distraction between the tibial and foot fixation before inserting wires into the talus. 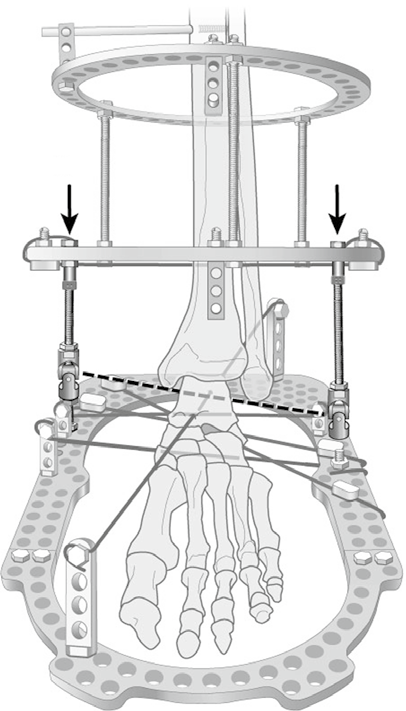 Two-ring fixation is placed on the tibia using a wire and three half-pins. 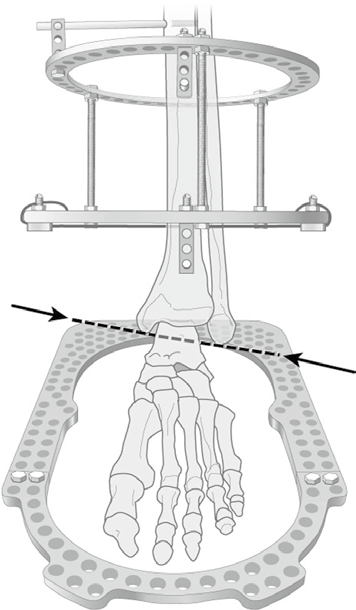 A center of rotation wire is placed through the Inman axis of the ankle (dotted line). This is used for positioning the ankle hinge. The foot ring is mounted parallel to the sole of the foot. 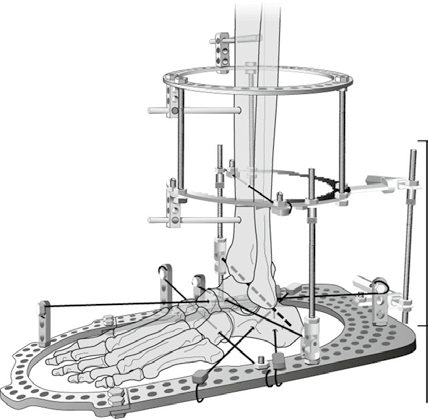 The foot ring is closed by attaching a half ring to the distal end of the U-shaped foot ring. Fixation of the foot ring is achieved with two crossed wires in the calcaneus, two talar neck wires, and one wire across the midfoot. Hinges are placed at the Inman axis. The patient starts distraction at a rate of 1 mm per day on postoperative day 1 for a total of 5 days. The goal is to achieve 8-10 mm of distraction. The external fixator is then maintained for 3 months while allowing weight bearing as tolerated. The patient performs daily ankle range of motion exercises and should attend physical therapy three times a week. In a published study, Dr. Paley and Dr. Lamm reported their results on 32 patients who underwent ankle joint distraction and found 78% had maintained their ankle range of motion and had none to occasional pain that could be managed with NSAIDs. Only one patient required an ankle fusion and only one was converted to an ankle joint replacement. These results suggest that Dr. Paley's and Dr. Lamm's approach improves upon the results of this procedure. Ankle joint distraction is a strong viable alternative to ankle arthrodesis or ankle replacement. A congruent, painful, mobile, and arthritic ankle joint treated with this technique can achieve good results. The à la carte approach developed by Drs. Paley and Lamm results in more successful outcomes using this approach.